L. Plaetorius L.f. Cestianus was one of the quaestors for the year 74 BC, and struck coins in this respect. Gens Plaetoria was a plebeian family at Rome. A number of Plaetorii appear in history during the first and second centuries BC, but none of this gens ever obtained the consulship. Several Plaetorii issued denarii from the late 70s into the 40s, of which one of the best known alludes to the assassination of Caesar on the Ides of March, since one of the Plaetorii was a partisan of Pompeius during the Civil War. Chase classifies the nomen Plaetorius among those gentilicia which were either of Roman origin, or which at least cannot be shown to have originated anywhere else, implying that the name is apparently of Latin derivation. Some scholars have suggested that the Plaetorii hailed from the ancient city of Tusculum in Latium. L. Plaetorius Cestianus struck coins jointly with M. Junius Brutus in 43-42 BC. He was Quaestor in 42 BC. The only distinct family of the Plaetorii under the Republic bore the cognomen Cestianus, probably indicating that they were originally adopted from the Cestii, a family of Praeneste. 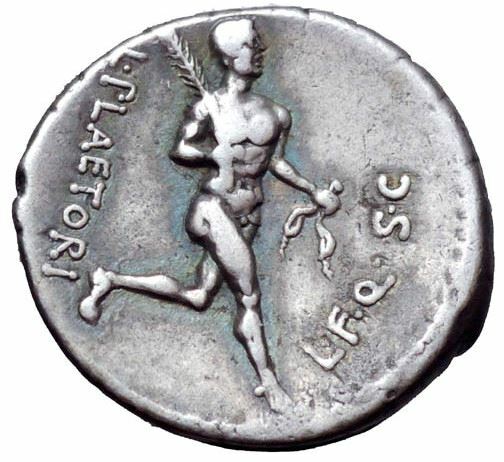 Their coins allude both to their name, depicting an athlete holding a cestus, and to a Praenestine origin, depicting Sors, the god of luck, associated with the renowned Praenestine oracle.